Have you ever run a big stack of $100 dollar bills through your shredder? No? Then why would you buy a new car? We’ve shared the basics of how to save on top expenses like food and housing. Transportation is the remaining top 3 topic. If you can use public transport, walk, bike, or carpool, do it! If, like me, you use a car to get multiple children around snowy, spread-out suburbs, here’s how to do it without debt. The average new car payment for Americans is $470 per month according to Time Magazine. That’s $5,520 a year. For a household with two average loans, that’s more than a quarter million dollars over 25 years. The average used car loan isn’t much cheaper, at $368 per month. The car companies and lending agencies have sold us on needing new cars, or at least a car payment. It’s considered a fact of life, as normal as taking a mortgage. But car loans aren’t necessary and are one of the worst forms of consumer debt. The vehicle depreciates greatly while you pay excessive amounts of interest. While it would take a really really long time to save enough cash for most houses, it is very reasonable to save up a thousand or few needed to buy a car. Most people don’t want to drive a $1,000 car forever, but if that is all you can afford right now, you certainly can’t afford to pay hundreds a month in a car payment. So open a savings account and call it Car Fund. Put the amount you would have spent on a car payment in there until you have enough to buy a decent used car. Let someone else take the big hit of initial depreciation. But won’t you spend tons in repairs if you buy older cars? This myth has become a mantra for those who accept car payments as necessary. Obviously you need to take along a savvy friend or trusted mechanic when purchasing a used car. However, the repairs you might run into with a used car will very likely cost less than the amount of interest you will pay with a new car payment. 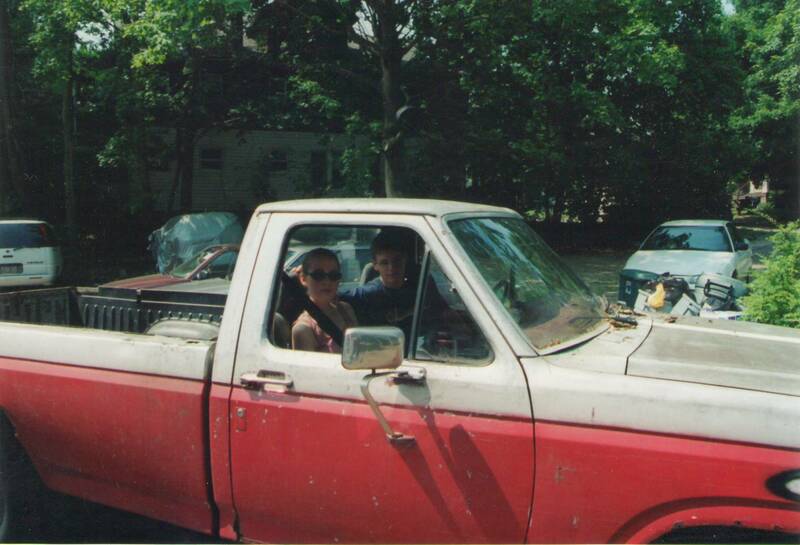 Yes, we actually owned this vehicle. Let me illustrate. 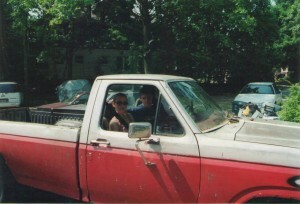 When Neil’s college car died (I’ll share its story in upcoming post “Free and Broken”), we bought a 1990 Dodge Shadow for $750 and drove it for four years. At the end we sold it for $500. So he drove it for about $5/per month during that time. You can afford a lot of repairs at $5 per month! And we had fewer problems with this beater than our 2002 Ford Focus (which is still going strong). Another common myth states buying a more fuel efficient car will save you money in the long run, even if it costs more up front. But the difference in fuel costs simply can’t make up for the huge disparity in price point. And let’s not pretend we’re too concerned about the environment when we’re creating a demand for the production of giant new vehicles. Speaking of fuel, do we all really have to drive gas-guzzling over-sized SUVs just to feel safe? While Hummer is bound to beat Beatle in a crash, automobile advertising pushes consumers’ panic buttons rather than providing real evidence that we all need a pricey new Land Rover to survive the week. What about keeping a new car for a long time? Making a new car last would certainly be preferable to the alternative but few have the discipline to drive a car for 20 years. Not to mention the depreciation and paying interest on something that will have little to no value at the end. What about buying a new car and paying it off really fast? Again, this is better than taking 5-6 years to pay it off but if you have the resources and discipline to do this, why not just save up until you can buy it? You’ll avoid the interest and the risk of not paying it off as expected. If you already have a car loan, this is exactly what you should do, unless you simply can’t afford your vehicle and need to sell it. So kill the car payment and reduce your yearly expenses by $4,000-10,000, on average. Together with switching grocery stores, you could free up as much as $15,000 without even suffering. Where do you stand on the new vs. used car debate? I’ve never bought a new car, but the 0% interest, full warranty, free oil changes, huge discount on last model years deals have definitely piqued my interest. We’ve been through a series of car repairs over the last few months and new cars are looking more and more appealing. But hopefully we’ll be able to keep our 2003 for many more years to come before I have to make that decision! Frequent car repairs can be tiring; hopefully you’re done for a while. Just start the car fund now! Great advice on learning to do car repairs yourself, this has personally saved me THOUSANDS — probably enough to buy a new car! Another strategy for people looking to lower their car payment without bearing the risk of buying a $500 beater is to buy a slightly used car with 10,000-40,000 miles on it. Research has shown that cars depreciate the most during the first few years of ownership, so you can get a practically new car at a bargain price. We have a slice of savings dedicated to obtaining a replacement car when when the cost of repairs on the old car exceed a certain fraction of what the car is actually worth. In theory, this sounds good. But lately, I’ve been wondering if that’s the best strategy..
For example, someone with a high credit score can get a very low rate on a car loan. If you take the money you would have been saving to pay cash for a car and invest it in a fund that gets 8% or more, paying cash for that car may not be the wisest thing to do. Put another way, by socking away money in a traditional account until you had enough to pay cash for your new car you’d be forfeiting 6% of the returns you’d get on that money (assuming 8% returns in a fund) if your credit was good and you qualified for a 2% rate on your loan. In the end, the best choice depends on a lot of different factors for different people, so use discretion! Thanks for sharing your thoughts. With personal finance it really helps to continue thinking through your options. Setting everything on auto pilot and not looking back is not a great way to handle money. Growing a car fund to a few thousand can get you a much nicer ride; the beater is just to get you through until you can save up enough. Why not save up and buy a 1 or 2 year old car? That seems like the best of both worlds for you. Lots of good points in that article that lots of people seem to overlook. I would suggest that car shoppers also look for the smallest, most mass produced , fuel efficient cars they can fit into. There is a huge potential in money savings doing these things as well. http://www.fueleconomy.gov has a rough fuel cost analyzer, that will show how money your car costs you per year. You can also find out how long a certain car was produced. Cars that have been in production longer have much cheaper parts. rockauto.com has great deals (much cheaper than local car parts stores and definitely less than dealerships) on car parts for those doing their own repairs, but you can also compare parts prices between vehicles. So for example compare a brake master cylinder from a Saturn to a Cadillac, even if you don’t do your own repair work you can get an idea of how much more you will be paying in repairs. Smaller cars will cost less in repairs and have some other benefits. Compare tires at discounttiredirect.com between a Saturn sw2 and a Cadillac escalade and see the initial cost savings of tires. Everything on then Cadillac is larger and costs more to make, and often wears out faster. This cost comes back to the owner in the long run. Used parts (especially body parts ie fenders, taillights) can save a fortune in repairs, but not if the car is too uncommon to be in a junkyard. In crash tests the car with more lug nuts wins, but in real life we dont drive our cars into brick walls at 50mph. In real life the big suv/van rolls over on the highway while the defensive driver smaller car just spins out or can quickly dart out of the way or just brakes. Handling and braking differences between cars vs SUV/vans/trucks/crossovers is huge. Smaller cars with (some pretty good h rated tires) can stop in half the distance of their larger counterparts. Smaller cars can go completely sideways at 60mph and not roll over. SUVs can roll at less than 40mph if they get sideways. Rollovers are generally a fatal event if you look at the statistics. Great tips and research, Jere! Yes–love beater cars! I had one for six years, made it to 223,000-some-odd miles, only paid $1300 cash for it (and only cosmetic repairs)…and then sold it for $400 when it died. What a great deal!! That is a great deal! Thanks for sharing. There are a lot of ways to approach this problem. Mine has been to buy a car that I would be happy to keep for at least ten years – so usually a new and loaded car. It does cost more upfront than buying used, but the difference amortizes over ten years, especially for someone who does not like dealing with maintenance. My current car is 5 years old and seems new. If it lasts another 15 years, I’d be happy. You are absolutely right Kalie. The second hand cars are almost always cheaper than the new ones if you look the total cost of ownership. I have personally owned several new and second hand cars. The second hand ones proved to be almost as reliable as the new ones, had almost the same fuel efficiency while cost several times less even if you pay cash for the new cars. I have learned this lesson few years ago and now I avoid buying new cars. Maintain your car properly, drive it only when it is necessary, drive it carefully, the rest of the time keep it in you garage and it will last forever. Cars are an important topic in our financial lives. A lot of people waste too much money on them, so I also may right and article in my blog regarding cars one day. I purchased 1 new car in my life. I regretted it many times. I really like the car. It’s a Jeep Liberty and it was very pretty and shiny. Not so much anymore, lol. But it was hard to pay for and there were times when money was a lot tighter than it was when I took on the payments. It was such a victory to have it paid off but it was painful to admit how much I paid. 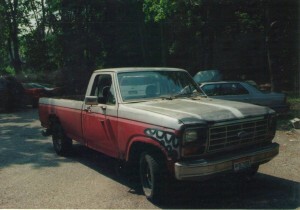 I’m still driving it 14 years later and intend to drive it until it absolutely won’t budge another inch. Then I am going to replace it with something preowned that gets good gas mileage and drive that one til it won’t move another inch. Never again will I buy new. What a powerful testimony in favor of preowned cars. Thanks for sharing it!